We just got back from a weekend of indulgence in Paso Robles. A belated b-day gift from my sweetie. We stayed at this amazing little B&B, The Canyon Villa, that had 4 rooms and the nicest owners. I would highly recommend this for your next wine tasting trip! At this B&B there was no TV, so needless to say, I devoured about 10 magazines in the course of the weekend. One of them was Oprah's Home Magazine for Winter 2006, which actually had an entire page devoted to Gifts that Give Back! Yipppeee! I immediately tore it out (sorry future guests!) and now I have a few postings worth of stuff to report on. Featured in TIME, The New York Times, and Country Living, these cozy blankies are a collaborative effort between FunQuilts and CARC, an organization that provides training and jobs for developmentally disabled adults in Chicago. 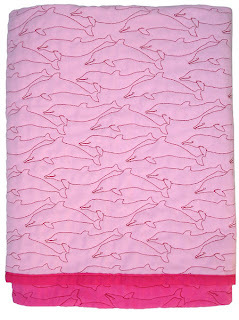 Each blankie is made from two layers of 100% cotton flannel stitched together in a charming animal pattern. 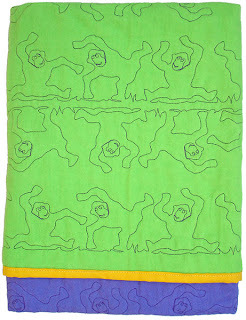 Stitching patterns include A Herd of Elephants, A Troop of Chimpanzees or A Pod of Dolphins. Your purchase of these blankies will provide meaningful employment to many hands. All colors and patterns are in stock for immediate delivery. Here are two of my favorites. Btw, these are only $75 each, which I think a really reasonable price for a handmade gift that is as whimsical and functional as these are. Enjoy!